We know a lot of the paddlers out there are both SUP and Kayak aficionados, meaning you've got multiple paddleboards and boats at home that you need to store. And for you, a rack that holds only paddleboards or only kayaks isn't going to cut it. 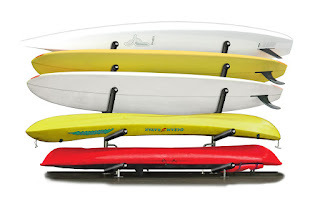 You need versatile, combo racks for both multiple kayaks and paddleboards. Check out some of our best combo racks to save you space in your garage, on your dock, or wherever you storage your kayaks and paddleboards. 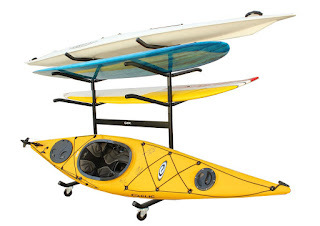 Freestanding 2 SUP and 2 Kayak Rack: here's a really easy way to store 2 kayaks and 2 paddleboards at home on the same rack, indoors or out. The rack is a powder-coated steel frame, with stainless steel hardware, meaning it's suited for outdoor environments. The base of the rack has two foam pads that hold 1 kayak. 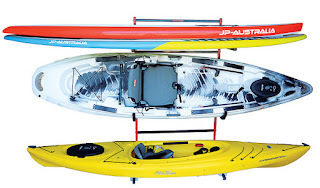 The next level is a set of J-style rack arms to hold another kayak, and the top level is a set of flat rack arms that can hold 2 paddleboards, 1 on top of the other. SUP and Kayak Storage Rack with Wheels: if you want to take your home or retail store or shop to the next level, check out this combo rack. It's got storage for 2 kayaks and 5 SUPs, so whatever size your quiver this rack will work for you. When you rack is that loaded, it's heavy and tough to move around but fortunately this freestanding floor rack comes with wheels, making it easy to get the rack from your storage spot to your car to load and unload all your gear. SUP and Kayak Dock Storage Rack: this is our high-end dock rack for the avid watermen that needs to store a bunch of kayaks and SUPs. Made out of stainless steel, it's ready for the outdoor elements (saltwater or freshwater environments). You can customize the rack with flat arms (for SUPs) or angled arms (for Kayaks) so it accommodates exactly what you need it to. 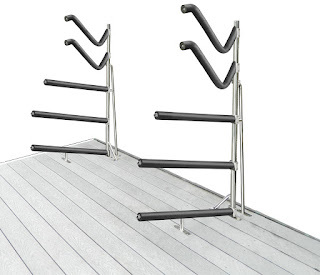 This is great for your dock, deck, or pier to save the trips back and forth from the water carrying your boards and kayaks.